Forty-two days have now passed since the last contact of Senegal’s single confirmed case of Ebola virus disease completed the requisite 21-day monitoring period, under medical supervision, developed no symptoms, and tested negative for the virus. WHO officially declares Senegal free of Ebola virus transmission. The response to Senegal’s first case, confirmed on 29 August, on the part of President Macky Sall, the Ministry of Health and Welfare, headed by Dr Awa Coll-Seck, and several other sectors of government, carries some instructive lessons for many other developing countries that are now wisely preparing to respond to an imported case. 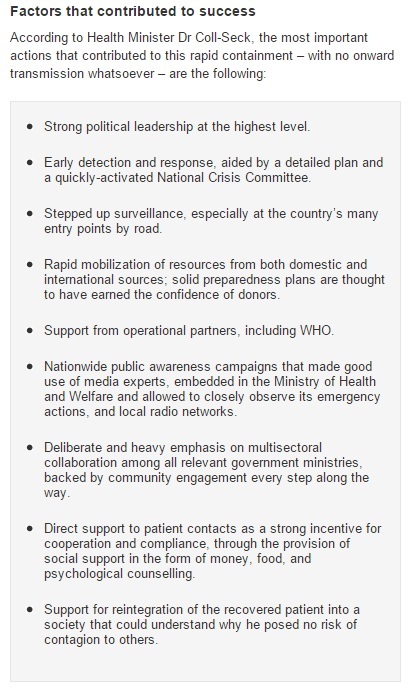 Other lessons come from staff at the WHO country office, senior epidemiologists sent to investigate and support the response, and WHO’s many institutional partners in outbreak response. WHO treated the first case in Senegal as a public health emergency, and responded accordingly. The most important lesson for the world at large is this: an immediate, broad-based, and well-coordinated response can stop the Ebola virus, carried into a country in an infected traveller, dead in its tracks. The outbreak in Senegal was announced on 29 August, when a case of Ebola virus disease was confirmed in a young man who had travelled to Dakar, by road, from Guinea, where he had had direct contact with an Ebola patient. Dakar was in a fortunate position: it is home to a world-class Senegalese foundation, the Pasteur Institute and its laboratory. The laboratory is fully approved by WHO to test quickly and reliably for viral haemorrhagic fevers, including a biosafety level IV pathogen like Ebola. WHO immediately dispatched 3 senior epidemiologists: Dr Guénaël Rodier, Dr Florimont Tshioko, and Dr Amada Berthe. Dr Rodier, a French national and WHO staff member, brought especially extensive frontline experience in containing some of history’s largest Ebola outbreaks. These epidemiologists worked shoulder-to-shoulder with staff from the Ministry of Health, headed by Dr Papa Amadou Diack, the country’s Director-General for health, the WHO country office, headed by Dr Alimata Jeanne Diarra-Nama, and other partners, especially Médecins sans Frontières and the US Centers for Disease Control and Prevention (CDC). With outbreaks raging just across its borders, Senegal was well-prepared, with a detailed response plan in place as early as March. From the outset, the response was led and coordinated, across multiple government, by Senegal’s President and Prime Minister. A National Crisis Committee provided the “nerve centre” for the emergency response. Local funds were immediately mobilized to support its work. These funds, supplemented by technical, material, and financial support from multiple partners, enabled immediate activation of the plan. Despite the fact that a single case had been detected in Dakar, the government decided to deploy the plan nationwide. The whole country moved into a heightened state of alert. Also critically important early on was the government’s decision to open a humanitarian corridor in Dakar to facilitate the movement and activities of humanitarian agencies. This decision meant that food, medicines, and other essential supplies could seamlessly and efficiently flow into the country. The initial investigation of the index cases revealed multiple opportunities for high-risk exposures in the outskirts of Dakar, where the patient initially stayed with relatives. A total of 74 close contacts were identified and rigorously monitored twice daily. Around five of these contacts developed non-specific influenza-like symptoms. Testing was prompt and reliable; all results were negative. Confidence grew with each passing day. On 5 September, just 8 days after the case was confirmed, laboratory samples from the index case tested negative, indicating a rapid and remarkable recovery. The fully recovered young man returned to his native Guinea on 18 September. Despite this good news, Senegal maintained a high level of vigilance for possible “hidden” pockets of infection that would have no doubt reached visibility during the long 42-day countdown that ends today. Ebola is too big a disease to stay hidden for that long. Senegal defeated the disease. The Ebola virus is gone – for now – from its territory.